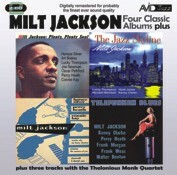 AVID Jazz here presents four classic Milt Jackson albums, including original LP liner notes on a finely re-mastered and low priced double CD. The Jazz Skyline, Milt Jackson Quartet, Telefunken Blues, Plenty Plenty Soul plus three tracks with the Thelonious Monk Quartet. The Jazz Skyline finds Milt in 1957 in a relaxing blowing session, perhaps a thousand miles away from the more structured and complex music he was making with his other day band, John Lewis and The Modern Jazz Quartet. For the Quartet sessions two years earlier in 1955 Jackson is joined by Horace Silver, Percy Heath and Connie Kay in a set comprising mostly standard material, but none the less intriguing for that! To conclude CD1 we slip in three cuts featuring Milt with the unique Thelonious Monk Quartet where we find the band covering three classic Monk sides, Misterioso, Epistrophy and I Mean You. CD2 kicks off with Telefunken Blues straddling 1954 -1955 and featuring Kenny Clarke as Leader and drummer. This album features some of the most exciting swinging jazz to be heard at that time! Concluding proceedings we have Plenty Plenty Soul from two recording dates in New York in 1957. Featuring a stellar bunch of musicians including Connie Kay, Oscar Pettiford, Lucky Thompson, Horace Silver, Percy Heath and Art Bakey among others. Milt himself, always his own fiercest critic of his sessions said he was very happy about this one... I chose the men for the date... I feel it all worked out. I think we would all agree with the great man about that, and all the above sessions!